This spring the Danish Architect’s Association arranged their very first architecture competition for children. The task was to design a mini-pavilion for Kongens Have in Copenhagen, and by doing so, the children should gain an understanding for architectural practice and develop their competences in relation to democratic processes. 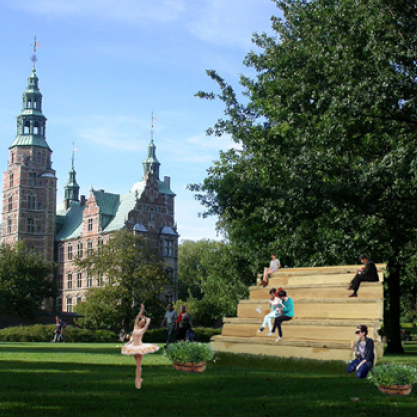 arki_lab worked with the students of Himmelev Skole in Roskilde to develop their entries. We were then pleasantly surprised to find out that the students Nicklas Frandsen, Julie Falk Schollert, Astrid Boel, and Bjarke Teis Winding, from 6.C in Himmelev Skole won the competition out of 85 entries! The team of Albert Winther, James Ellegaard, Jonas Knudsen and Isaac Holst from the class also received an honorable mention. As a reward, their whole class won a trip to Copenhagen to have an architectural workshop and meet the architects building the actual pavilion in Kongens Have. As a next step, arki_lab will help them detail their projects and seek funding to have the pavilions built on their school campus. In order to construct the pavilion, we intend to reach out to apprenticeship-seeking carpentry students in order to activate other members of the community through all aspects of the project. At arki_lab we believe that it can have a positive effect both for the pupils and students involved in projects like this, but also for the overall success of the architecture of schools and public spaces, when children and youth are engaged in co-creating their own schoolyards and classrooms. We are ecstatic that the winning entries from Himmelev Skole will prove to the students that they have the potential to affect the design of their own learning and recreational spaces.